Our mission and greatest joy is to support your journey to greater wholeness, so you can live and enjoy your live fully! Our mission is to guide people to awaken Consciousness within themselves, so that they can harness, cultivate and direct its power for greater health and wellbeing. We use our knowledge and experience to help our clients become free from illness, pain and stress. We truly believe that all people are meant to live empowered, expressive and meaningful lives. area of your life, both on and off the yoga mat. iLEAP: "Into Life Empowered and Present" TM. We also offer individual sessions and retreats. 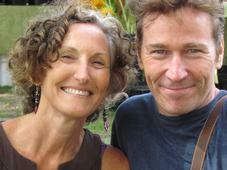 Our joy is to share what we love most: the yogic lifestyle. We know that with sustained, regular practice of Prakasa Yoga you will reap great benefits: a strong and supple body, a peaceful mind and a happy radiant heart. We invite you to study with us and discover effective ways to nurture yourself and your family. We'll share our best tips for cultivating lasting health and vitality, so you can look your best and feel your youngest each and everyday. We'd love to hear about your experiences at Prakasa Yoga Studio. Please write to us and share your story. Remember to tell your friends how yoga is shaping your life.